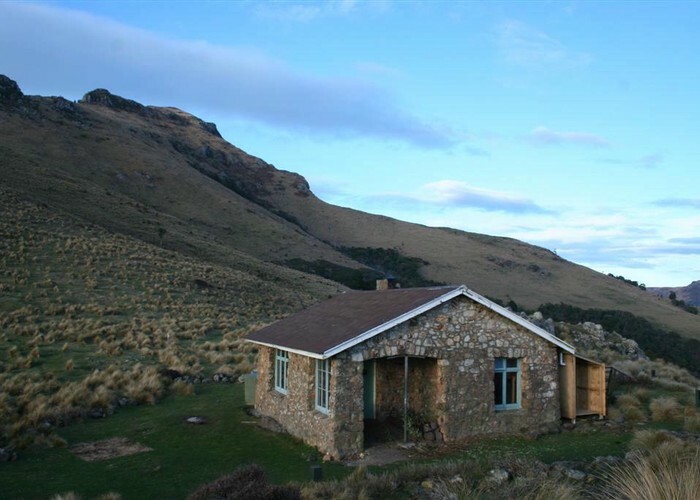 A stone hut perched on a saddle next to Mount Bradley, with commanding views of Lyttelton Harbour. The "Sign of the Packhorse" was conceived and built (1916) by Harry Ell as a rest house on the Summit Road. This section of road was never constructed, although the legal right-of-way remains. The hut was built from local stone, and designed by Christchurch architect Samuel Hearst Seager in a "vernacular style." Sign of the Packhorse • By Matthew. Allong the Packhorse Hut Track from Kaituna Valley, or along Summit Walkway from Gebbies Pass. Quickest route is from Gebbies Pass. Bookings are required from 15 October 2015. Added 31 July 2008 by MatthewMatthew. 5 revisions, most recently 6 October 2015 by MatthewMatthew. 179 views in the past year (15 per month).